It’s a rare moment when Warren Buffett makes a mistake. But sometimes he does and, well, you’ve got to call a spade a spade. Even Buffett himself has admitted that he’s made some blunders. And there’s a lesson to be learned from one of his biggest mistakes: It’s never too late. In today’s piece, I’ll explain exactly what that means – and how to apply that mindset to your own investing. Back during the dot-com boom and subsequent bust, Buffett avoided losing money on internet stocks. At the time, he said he wouldn’t invest in technology stocks because he didn’t understand the technology itself. Then, in 2011, he began investing in IBM (NYSE: IBM). It was a so-so investment that did not live up to his expectations. At the end of last year, he revealed that Berkshire Hathaway owned more than 160 million shares of Apple (Nasdaq: AAPL). There is no doubt that he owns (or wants to own) even more today. He also confessed that he wishes he would have bought shares of Amazon (Nasdaq: AMZN). Like a lot of people, he didn’t think it would succeed the way it has. Buffett left a lot of money on the table – billions of dollars for himself and for Berkshire shareholders. But what he did in 2016 and 2017 – and even what he did with his poor IBM investment – is what you should really be paying attention to. Buffett realized that he made a mistake by prejudging an entire sector. So he changed his ways by hiring people who understood the sector and who could help him invest wisely. Taking the time to understand the market made him billions more from his investments like Apple. Change is tough, I know. I’ve been there as well. 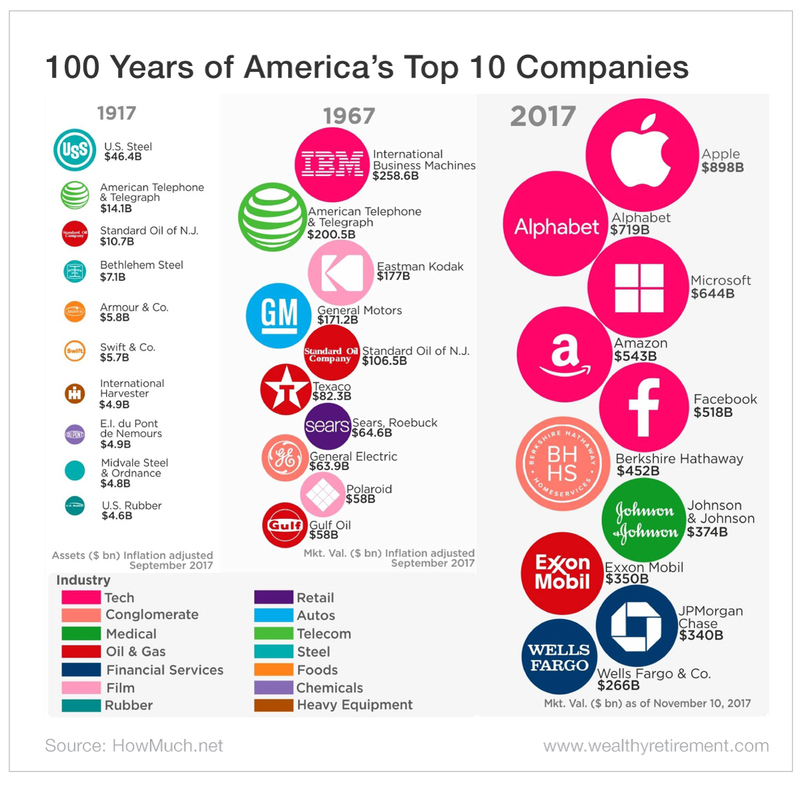 But as I look across my portfolio, I see the types of companies I would not have looked at twice a decade ago, for the same reasons that Buffett stated: I just didn’t understand them. It may not have cost me billions, but it has cost me a ton of potential profits. Think about this: A hundred years ago, the biggest U.S. publicly traded company was U.S. Steel (NYSE: X). Adjusted for inflation, it was worth around $47 billion. Fast-forward to today when the top five companies (based on valuation at the end of 2017) are technology companies. In fact, this month Apple surpassed $1 trillion in market value with Amazon close behind, breathing down its neck. We all have comfort zones. We like companies that we’re used to. Names like GE and IBM are icons of the ’70s, ’80s and ’90s. But they have cost shareholders like you and me dearly, by either falling in value or not growing at the same rate as the market. Add in how much we’ve lost in opportunity cost… That’s just too depressing to think about! But it’s not too late. 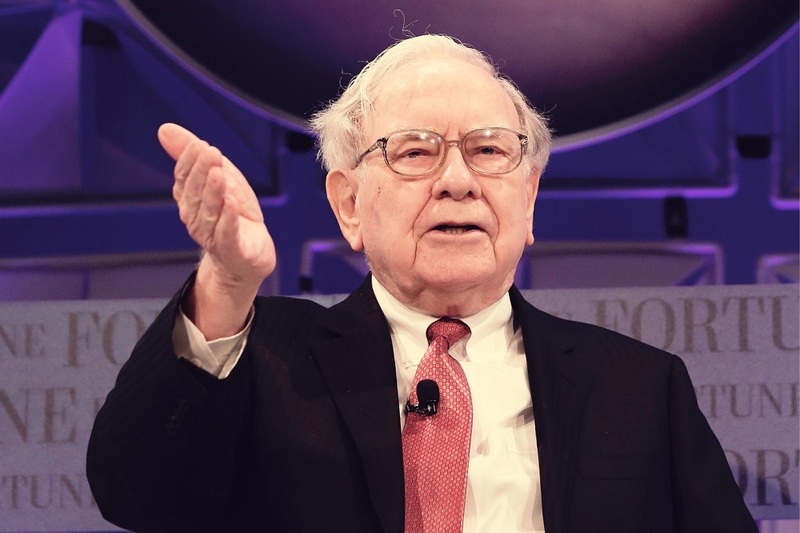 If Buffett can change how he chooses investments – with a ton of due diligence – in his 80s, we should be able to do the same, at whatever age that might be. And rethinking how we invest could mean the difference between achieving our dreams early versus never at all. So the next time you see a hot technology story, some new biotech claim or even something like cryptocurrency, put your initial instincts aside. Do some research. Try to understand the business or industry, and THEN make your decision. And, according to Buffett, if you’re not willing to put in at least six to eight hours a week on your portfolio, stick to investing in index funds.